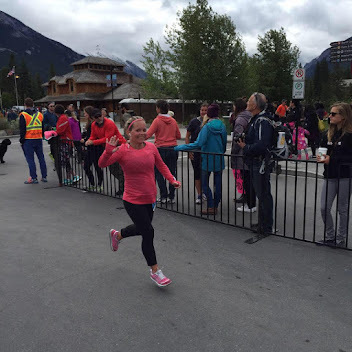 Back in mid-October, Greg ran a relay race in Banff with work. He couldn't find his garmin watch so I was a nice person to lend him mine. Unfortunately for some reason, unbeknownst to him, the watch never made it back home. I had looked at just replacing it with the same watch that I had but it had been discontinued. So I decided that I would get the Garmin Forerunner 35 in white instead. 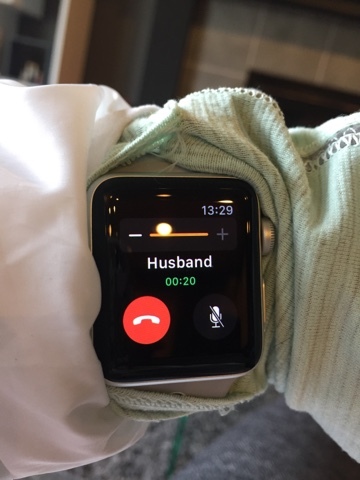 Greg suggested looking at the Apple Watch and I immediately dismissed him because I had heard it was a terrible running watch which is what I needed it most for. 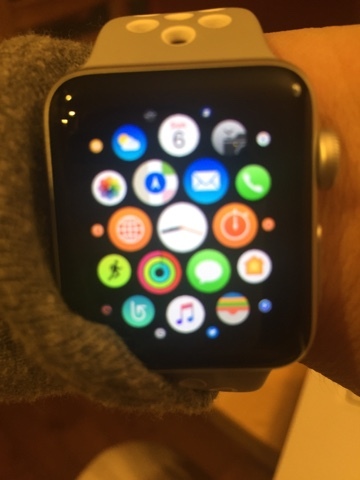 However, Greg did some research and saw that the Apple Series 2 Watch had GPS and was a good running watch. 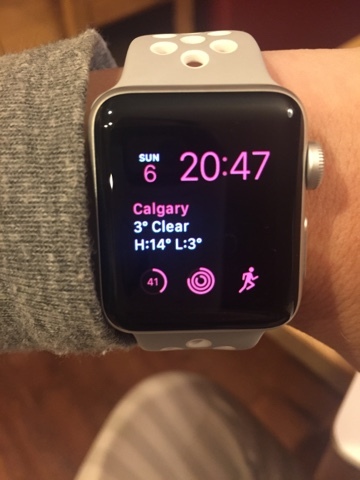 I went on to my SeaWheeze Chat page and found a post on the comparison between various Garmin watches and the Apple Watch. You had a lot of pro-garmin users but there were more then I thought that really loved their apple watch and were even more excited about the Series 2 watch coming out since it had built in GPS and didn't need additional apps to run like the original Apple Watch. Worst case scenario was that if I didn't like it I could always return it. So I went to order it so I could pick it up at the Apple Store and they were sold out. Best Buy in store and online was also sold out. So I was forced to order it online and then wait for what felt like forever to get it. This was the watch I had settled on. I loved the whiteness and clean look of it. But I was really sad to have to wait even more then a month for it to arrive. 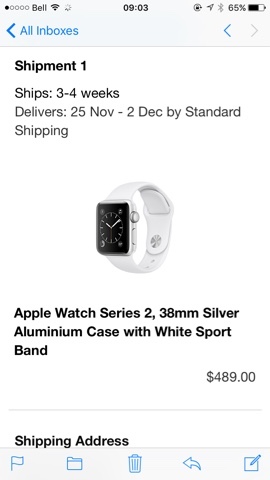 A few days later I noticed that the Apple Nike Plus Series 2 Watch had been released on Thursday. I checked online and it said that in store stock was not available and to order it they said it was the same time frame to arrive at my house as the first watch I ordered. For some reason, I looked the day after and they had stock at the Chinook Centre Apple Store location so I ordered it and went to pick it up later that morning. I did call the Apple Support Centre to cancel my first order though first. 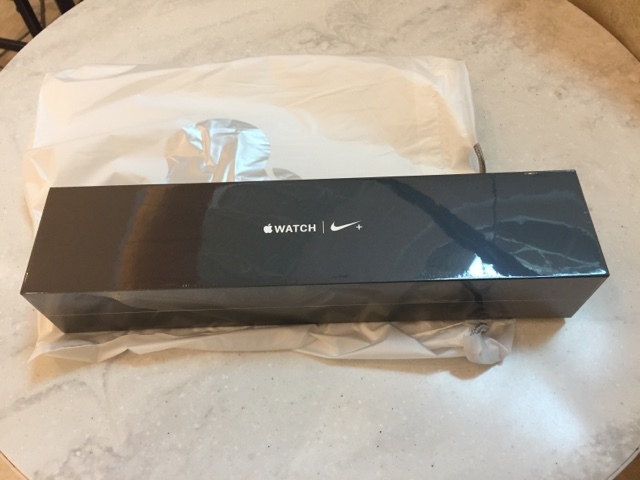 I was so excited to get this Apple Watch and bring it home to play with it. The box was so sleek and perfect. I got it home and played with it and had no idea how to use it. I texted Greg to tell him that I hated it and it needed to go back. He called me and I answered and spoke to him through the watch which was actually really cool and made me feel like Penny from Inspector Gadget. The charging mechanism was pretty cool. 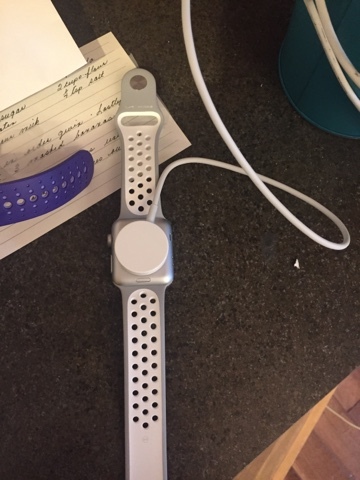 It was magnetic and I just attach it to the bottom of the watch to charge. You have to charge it every night because the more you use it the faster it drains. I have never ran out of battery power yet or even come close for that matter. You can change the face of your apple watch to anything you want and change the colours too. I play around with it all the time but most of the time it is. It even has some Disneyland themed ones that I plan to use on my trip. The top left is the date, middle is time and temperature. Bottom left is battery life remaining, middle is my activity which tracks steps, calories, exercise and standing time. The bottom right is the built in apple watch activity tracker. I use it for bootcamp and walking. I don't use it for running because it doesn't have intervals. The Activity comes preset with x amount of calories and 30 minutes of exercise and 12 hours of standing. I have no idea how they calculate calories and how accurate it is or isn't but for the first full week I did it I never once hit the calorie goal on a single day. When I went to start the second week, it suggested that I lower my calorie goal since my previous week was very unsuccessful. I have since crushed that goal every day and I assume that for week 3 which starts when I am in Disneyland will be increased a little bit again only to get destroyed by all the walking i will be doing to be brought back up when I return to Calgary and then won't meet before they get dropped back to normal hahahahah. The Apple Watch comes with 2 Apps: Activity that automatically downloads I believe when you sync your watch with your iPhone and the watch app that has been on your iPhone automatically since it was introduced last year. The Watch app allows you to change your face and the apps that you want to have access on your watch. Not all apps are watch compatible but several are. This is where all the apps are stored and then you take your favourite 6 or 8 and have them on your dock. I have my workout app, my activity app, messenger, instagram, music, runtatstic, their built in breathe app, and the weather network. I don't really use any of the other apps yet on my watch. Messenger has pre-programmed messages or you can use suri to send real messages. It doesn't use punctuation though so I send some long winded text messages haha. I like the speaking texting but it's a little weird when i am not alone hahaha. The Apple Nike Plus Series 2 Watch comes with the Nike Run Club app which I really liked but I wasn't able to do intervals on it and I need intervals to run. I googled apple watch compatible running apps with intervals and downloaded every single one and I sought the advice of my running group. Runkeeper was a really popular one so I downloaded it and set up custom interval training for it. I set it up for 5 and 1's but when I started using it, it let me run for 5 minutes and then it stopped and told me what I ran in 5 minutes and then started another 5 minute interval. It somehow skipped the one minute walk/recovery part so I had to do it all manually in my head. Time to do more research. I downloaded more apps and discovered that they all sucked but Runtastic. I needed to pay $6.99 to upgrade to get my intervals saved so I didn't have to program it every run. I have programmed for 5 and 1's, 10 and 1's and 15 and 1's. It also tracks the milage on my shoes and it does all my distances and stuff in km which I like. The only downfall is that I need to have my iPhone to use intervals as the watch doesn't have interval ability at the moment. I figure that in the next few months this will change as watch apps adapt to the new apple series 2 capabilities. Either way I am really happy with this app and I recommend it if you run with an apple watch. Well worth the $6.99 and I never pay for any apps. It's been 2 weeks since I got it and I am so happy that Greg convinced me to get it. It has so many amazing features for only a little more then the average garmin and same price and even cheaper then many similar garmins.